Clear and Proper Communication is the Backbone to a Successful Relationship. Does Your Contractor Understand this Basic Principle? One of the most common causes of headaches and frustrations is simply poor communication between the contractor and you, the client, throughout the whole project. We have found ways to be proactive in keeping you up to date on what's going on before, during and after your project. A quick and easy way to size up a company, right off the bat, is to see how they answer your first call. Do they answer the phone at all? Are you getting voice mail, or worse yet, a pager? Do they respond to your inquiry or get you answers within a timely manner? During the initial consultations, are they trying to pressure you into replacing the entire roof without even knowing if that is what you need? Are you given vague or reluctant answers to your questions? We have five lines that allow you to reach an actual person and talk to someone to get an answer, as well as cell phones that can reach us any time for emergencies. Is the contractor responsive to your situation and your immediate and long-term needs? Are your plans reviewed before they're finalized so you have a thorough understanding of the entire project before they set foot near your roof? This is what we do at Bright Roofing, before any work begins. As we fix your roof, we create a roof sketch, or use a satellite shot of the building, to indicate where the current problem on the roof was. We also mark where each leak occurred and where we repaired things. This document becomes a permanent database on your building and our experience with it. We offer this roof diagram with x's and o's on it to be accountable and to communicate to you that we are not repairing the same thing twice. Most of the time these pictures show up with our diagnosis in the proposal. It allows us to show you why we are suggesting certain solutions. Unfortunately, it's not uncommon in our industry to have problems, questions and concerns after a project is finished. So what happens if there is a problem on the exact same spot? We come back on our own time and fix it. All our work is guaranteed for two years. Some roofing projects we will guarantee ourselves. 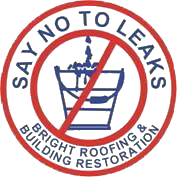 Other roof jobs give manufacturer's warranties from 10-20, even 30 years now. Our two-year guarantee is an actual certificate written and signed by an officer of our company and the building owner. It's printed by the Michigan Roofing Contractors Association, MIRCA.